The David L. Lawrence Convention Center opened in Pittsburgh in 2003 as the world’s first certified green convention center and remains, to this day, the largest LEED® Gold-certified building in the world. Encompassing more than 1.5 million square feet of exhibit and meeting space, the building is one of the foremost examples of an architect integrating into a single building the full spectrum of architectural glass, coatings and paints. In this instance, a primary goal of the architect was to create an environmentally advanced structure that would repay its energy investment in less than ten years. Consequently, in addition to its striking design, the building features a number of innovative engineering flourishes, including a cooling plant that runs on water drawn from an underground aquifer; natural cross-ventilation created by river currents collected by the center’s swooping roofline; and a gray water system that recycles half the center’s water, saving an estimated 6.5 million gallons of water annually. The convention center also draws on several products from the PPG collection of glass, coatings and paint solutions.For instance, the entire exhibit hall can be lit entirely through skylights and windows fabricated from PPG SOLARBAN® 60 Solar Control Low-E Coated Glass. The building’s abundant clerestory windows also are crafted from Solarban 60 glass. With a clear aesthetic that promotes maximum daylighting, Solarban 60 glass offers exceptional solar control characteristics. Combined with the ventilation system, the daylighting and solar control of Solarban 60 glass enable the center to consume about 35 percent less energy than a standard building of its size, resulting in more than $500,000 or 3.8 million kilowatts of energy savings per year. PPG coatings and paint also are instrumental to the environmental performance of the building both indoors and out. 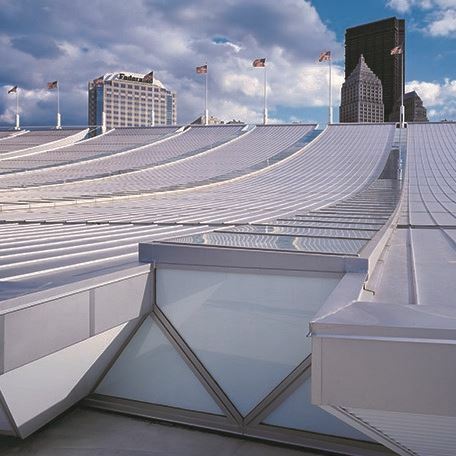 On the metal building panels and skylights, various shades of DURANAR® coatings from PPG provide extended durability, which eliminates the need for repainting and other kinds of maintenance. Indoors, zero- and low-emitting paints and coatings such as PPG PAINTS™ PURE PERFORMANCE® paint reduce exposure to airborne toxins and deliver a healthful and attractive meeting and convention environment. The materials used to construct the building, including those from PPG, have recycled content and were mostly manufactured within a 500-mile radius of Pittsburgh.